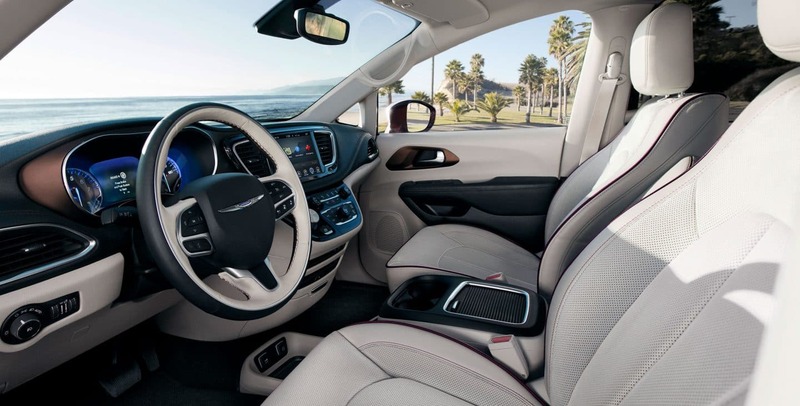 The 2018 Chrysler Pacifica reimagines what it is to be a minivan with an extraordinary level of technology, adaptability, design, and most importantly, functionality. The Pacifica has been completely redesigned from previous models, outpacing other minivans in gasoline and hybrid powertrains. 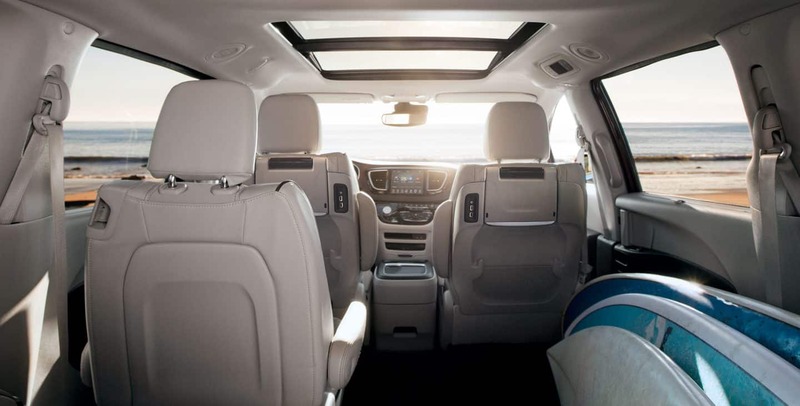 This reworked Pacifica has over 100 safety and security options, will provide endless entertainment with the Uconnect Theater, and has worked on being the most convenient minivan that will not leave the consumer having to decide between which feature they want more. 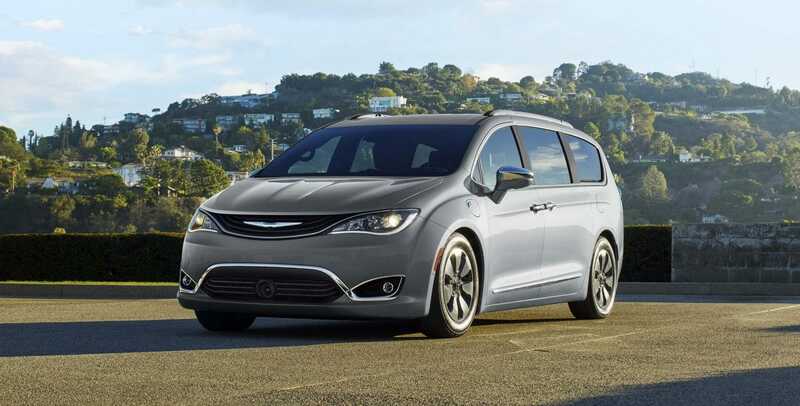 There are new Pacifica models, including the Chrysler Pacifica L, and the Chrysler Pacifica Hybrid Touring Plus. 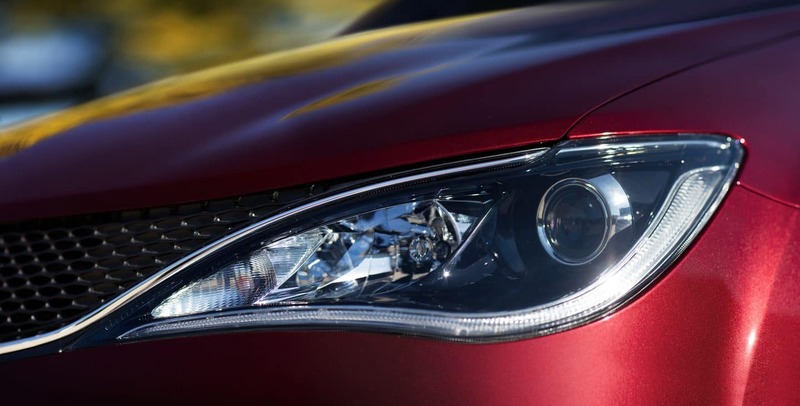 With those additional models, there are now six 2018 Chrysler Pacifica models, and three 2018 Chrysler Pacifica Hybrid models. 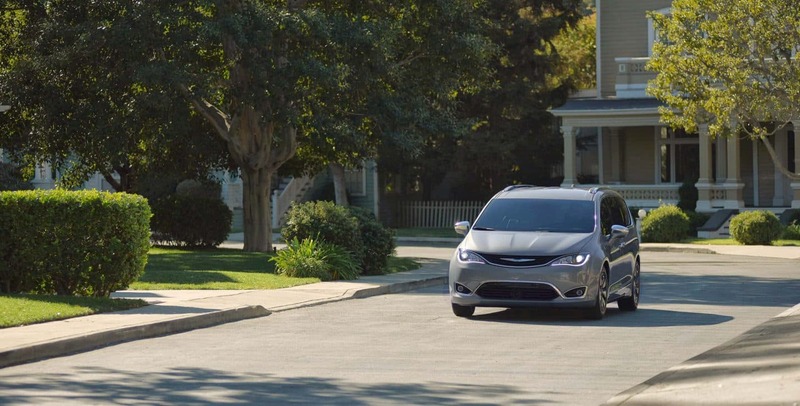 Every 2018 Chrysler Pacifica, including Hybrid models, come standard with ParkSense Rear Park Assist with Stop, Rear Cross Path detection, and Blind-spot Monitoring. Every model is also given Apple CarPlay and Android Auto as a standard feature, while also giving more options to further customize models. Some of these options include features that have just been made available on multiple models, such as remote start and security alarm, perforated leather seats, tri-pane panoramic sunroof, a Deep Mocha interior, a universal garage door opener, and even the option to have 4G LTE Wi-Fi connectivity with the navigation system. What power and towing capabilities do the 2018 Chrysler Pacifica's have? Every standard Chrysler Pacifica has a 3.6-liter V6 engine, and a TorqueFlite nine-speed automatic transmission. There is a towing option called Trailer Tow Group which is only available on Touring Plus and the models that follow. This package adds four- and seven-pin wiring harness, as well as a 2-inch hitch receiver. The maximum towing capacity is 3,600 lbs. The Pacifica has been redesigned, turning it into a class-leading minivan when it comes to handling, ride, and a reduction of noise. This redesign has also created a fuel efficient minivan with a sleek style. The Hybrid version of the Pacifica can go 84 mpg in electric-only mode, and 33 miles of all-electric range. What trim options do I have for the 2018 Chrysler Pacifica? There are six trims that the main 2018 Chrysler Pacifica is sold in; the L, LX, Touring Plus, Touring L, Touring L Plus, and Limited. There are also three different trims for the 2018 Chrysler Pacifica Hybrid,Touring Plus, Touring L, and Limited. The entry level Pacifica L comes with Bluetooth, no-key ignition and no-key entry on the driver side door, 7-inch touchscreen, the standard Apple and Android compatible Auto and CarPlay, audio system with six speakers, as well as an auxiliary jack, and a USB port. There is also a 60/40 split folding seat in the third row, which can help store more cargo, or fit more passengers. The next trim level is the Pacifica LX, which instead of having the 17-inch steel wheels, now has the 17-inch alloy wheels, trim on the exterior, displayed information for the driver, eight-way power driver seat, climate control in three zones instead of the dual-zone of the Pacifica L, as well as Stow 'n Go second-row seats. 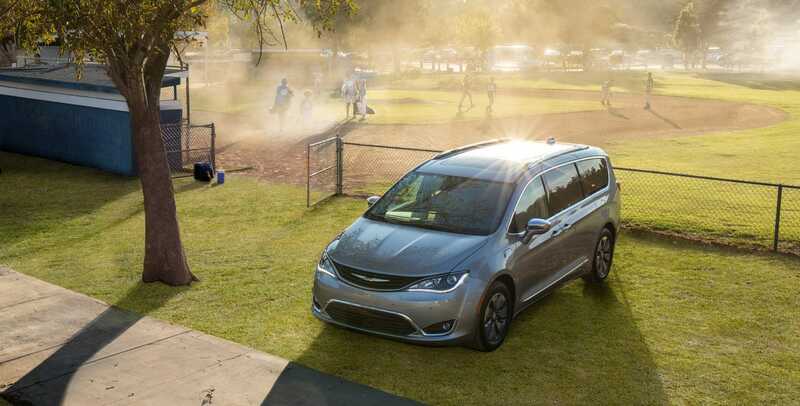 The Pacifica Touring Plus includes the addition of automatic headlights, chrome exterior on the trim, keyless entry for the whole vehicle, automatic climate control, power liftgate, satellite radio, power-sliding doors in the rear, and a USB port specifically for charging. 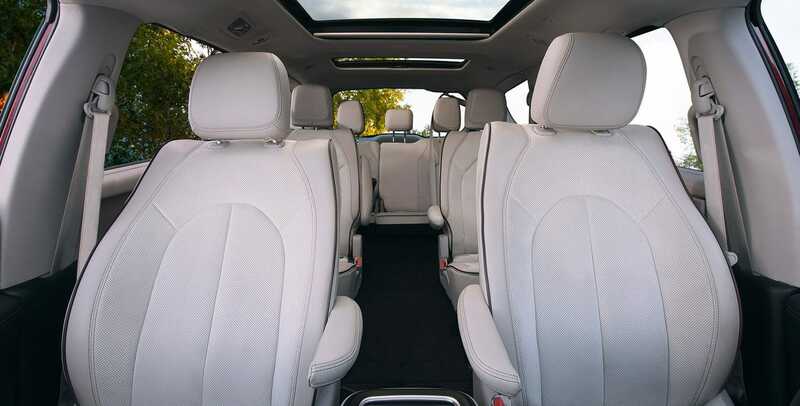 The Pacifica Touring L adds the eight-way power seat to the passenger's seat, both seats up front are heated, as well as leather interior, additional USB ports, and shades to block out the sun in the two back rows. 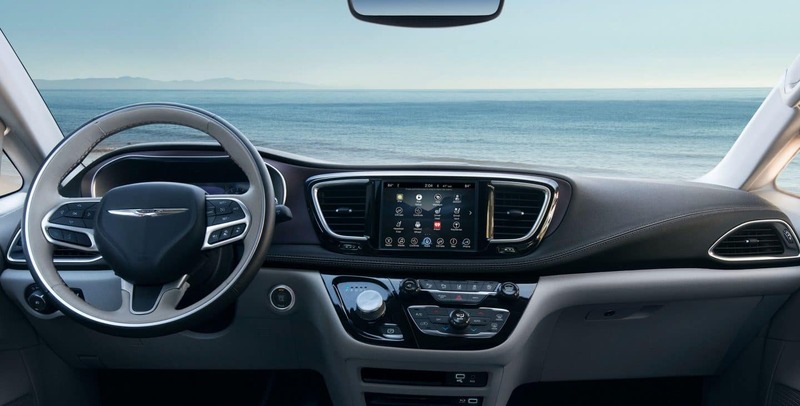 The Pacifica Touring L comes in multiple different selections, including one called the Alpine Sound package which enhances the audio system with 13-speakers, enlarges the touchscreen with HD radio to 8.4-inches, and adds a USB port to the third-row. Another package option for the Touring L is the Advanced SafetyTec package, which helps with reducing sound on the windshield, adds control for automatic high beams, adds automatic wipers, departure warning when switching lanes, parking system that is automated, forward collision warning with emergency braking, and a larger display for driver information. The Pacifica Touring L Plus also contains the larger driver information panel, as well as the noise reducing windshield, but additionally adds a heated steering wheel, mood lighting, a larger 8.4-inch touchscreen, and the Alpine audio system. Adding onto that audio system, the Touring Plus has the ability to have a 20-speaker Harman Kardon audio system. The Touring models have the ability to upgrade to 18-inch wheels. The last potential trim option is the Pacifica Limited, which instead of having to be upgraded separately, comes with 18-inch wheels, memory settings for the driver, leather interior, sliding doors and hands-free liftgate, LED foglights, mirrors that power-fold as the third-row seating that power-folds. There is an option for all models to include KeySense, which places a limit on how fast the Pacifica can go, and the volume of the radio. 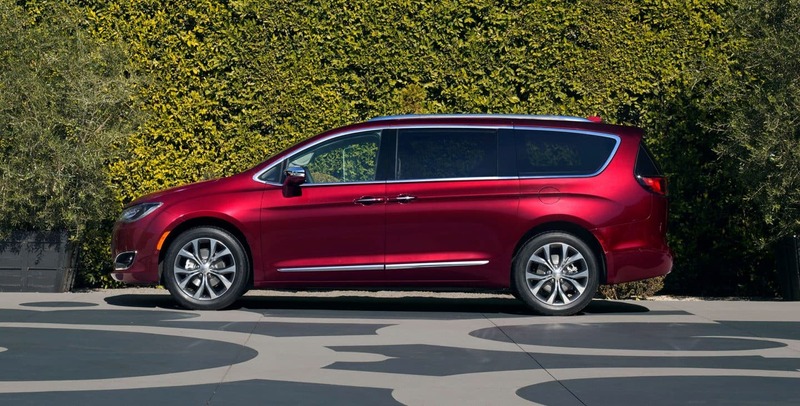 Exterior colors for the 2018 Chrysler Pacifica include Billet Silver Metallic, Copper, Brilliant Black, Jazz Blue, Velvet Red, Bright White, Granite Crystal Metallic, Dark Cordovan, Molten Silver Metallic, and Ocean Blue Metallic. Interior color options include Black, Coffee, Alloy, and Deep Mocha. What are some of the safety features of the 2018 Chrysler Pacifica? There are more than 100 safety features, as well as additional available ones that can be added to different models. Standard models all come equipped with blind-spot monitoring, rear view camera, parking sensors in the back, and rear cross-traffic alert. A few of the many additional features include ParkSense Parallel/Perpendicular Park Assist, Forward Collision Warning-Plus, 360-degree Surround View Camera, and Adaptive Cruise Control with Stop and Go. The 2018 Chrysler Pacifica also has safety features for children and their car seats, including two sets of latch anchors, and a tether anchor in the middle seat. The Touring L has a special package option available called Advanced SafetyTec which adds warning of forward collisions and braking in case of an emergency, top-down parking camera, departure warning when switching lanes, and an automated parking system. The 2018 Chrysler Pacifica has reinvented what it means to be a minivan. With over 100 safety features, and endless options for entertainment purposes, the 2018 Pacifica is the perfect vehicle to suit not only the needs of a family, but even expanding into towing capabilities, and putting your pedal to the metal. Don't believe us? Ask us any questions you might have, or better yet, come on down and give one of our new 2018 Chrysler Pacifica's a test drive.